The terre d’Oc natural lipgloss in a long lasting, trendy peach shade which complement the range of terre d’Oc natural lipsticks. The terre d’Oc lip gloss in a perfect peachy tone that will compliment any skin tone. The lip gloss formulation results in a shiny, mirror effect to draw attraction to the natural beauty of your lips. The terre d’Oc natural lip gloss with it’s organic formulation includes coconut butter and a tasty cherry flavour to combine comfort and moisturising properties with a stunning lip look. 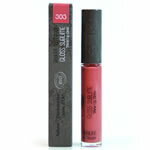 Natural Lipgloss can be applied on top of terre d’Oc natural lipsticks or the lip gloss can be used alone. For fuller looking lips dab a little lip gloss to the centre of your lips.